Yorkshire Tea is the second highest selling tea in Britain, with a 23 percent market share as of 2017. Historically the leading tea brands in Britain have all been owned by large, wealthy corporations. It was argued that these companies had an advantage over small regional concerns due to marketing, distribution and technical expertise, as well as cost-scale efficiencies. Many people would struggle to differentiate between Tetley, PG Tips and Typhoo in a blind taste testing. Twinings is different from the more mainstream three, as it is a more premium product. Value: the product offered quality at a moderate cost. Due to this, it rapidly established a cult following. Technical innovation: the owner, Taylors of Harrogate, distributed slightly different blends in each UK region, in order to best suit the local water supply. (This ceased in 2000 when a Hard Water version was launched). Branding: the packaging of the product evoked imagery of old rural Yorkshire. It tied in to a desire for provenance, and smaller-scale craft production. The slogan on the box, “Let’s have a proper brew” suggests authenticity due to the product’s local-ness and smaller scale production. It also indicates that its competitors do not offer this. Also the name, “Yorkshire Tea” is no-nonsense and straight forward. Advertising: The brand was not advertised on television until 1997, when it sponsored Heartbeat. The association was canny: Heartbeat was a programme that was strongly associated with rural Yorkshire. Marketing: The tea was offered for free to branches of the Women’s Institute until 2011. This gave women (who usually do the grocery shopping) a chance to taste the product. 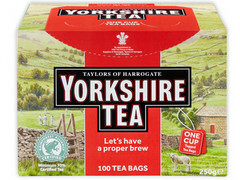 The Grocer also suggest that Yorkshire Tea has a “stronger taste profile” than its competitors. By 1994, five million cups of Yorkshire Tea were drunk each day. By 2001 this had grown to nine million cups. The brand had sales of £46.1 million in 2010. Value sales grew an impressive 66 percent between 2009 and 2014. Previous PostThe history of Dunkin’ Donuts in the UKNext PostWhy can’t you get Black Sheep Best Bitter at Wetherspoons?